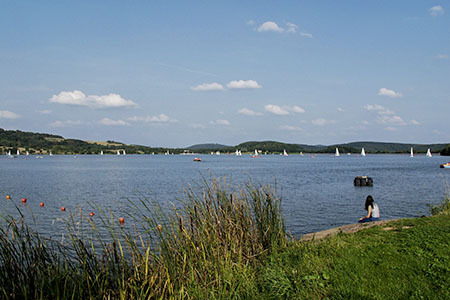 Bostal Lake lies in the valley of the fairly young Nahe River, not far from the source of the Nahe near Selbach. With a surface area of 120 hectares, it is the largest reservoir in southwest Germany and is fed to the west by the two tributaries, Bosbach Creek and Dämelbach Creek, themselves flowing into the Nahe from the southern branches of the Hochwald mountain region. Bosbach Creek continues beyond the retaining wall and eventually flows into the Nahe at Gonnesweiler. Because of its very appealing location, Bostal Lake has quickly become a popular destination for the entire region, not least thanks to the diverse leisure and water sport facilities offered here. You will find two bathing beaches, an indoor swimming pool, a sailing school, sailing harbour, surfing school, floating/landing beach for surfers, boats for excursions on the lake, fairgrounds, the "Bosener Mühle" art centre as well as a music pavilion. As well as all this part of the lake is also a nature preserve. It is important to note that Bostal Lake lies directly on the "Street of Sculptures" ("Straße der Skulpturen"), a 25 km long trail that leads from St. Wendel to Bosen. There are 51 works by 48 artists from 11 countries along this route. If you walk around Bostal Lake, you see sculptures no. 35 ("Requiem für die Juden" by Shelomon Seliger) and no. 36 ("Liebesthron" by Leo Kornbrust), which are about 15 minutes apart. The "Bosener Mühle" on the north-eastern tip of the lake, where regular art exhibitions and concerts take place, is a meeting point for any kind of art enthusiast.